The Importance of the Pool Cue Tip? In recent years the billiard world has reaped the price benefits of having pool cues mass-produced in China & even though the quality of these cues is good & getting better all the time, there will always be a small percentage of any mass-produced item that will have manufacturing faults. Most of these faults should be covered under a sellers warranty; however, the one thing that’s never covered under any warranty is the adhering & quality of the tip used. And yet, just like the tyres on a car, the tip of a cue (being the point of contact between the cue & the ball) is one of the most important aspects of cue quality. As you may have read on our site, we offer a $9.95 Blue Diamond re-tip on any Custom Cues with a 9.5mm tip, so that our customers receive a cue that not only feels great to play with but has a tip that is adhered correctly. This service naturally isn’t offered with 11m screw on tips or 13mm nylon tips. Besides being the only company in the world that does decal-based custom cues, we are also the only billiard seller that offers a re-tip service when purchasing a cue. It makes sense that the first blog to kick off our new website would be an informative guide on how to re-tip all of your other cues so that they feel as good as ours. When do I replace my Pool Cue Tip? Basically, your tip either gets worn down by sanding & re-shaping or it has become compressed. Because, it’s essential to keep the surface of your cue tip rough, so as it grips the ball, the eventual replacement of a tip is inevitable. Some players have a different cue, just for breaking, so as to avoid the latter (compression of the tip). There are no hard fast rules as to when you change your tip. I’d just say, change it when your cue performance has dropped below an acceptable level because the tip is worn or compressed to the point of no return. I like this particular instructional video because, except for the type of glue used, which is explained below, the method is exactly how we re-tip our cues. The video is also easy to follow & doesn’t rely on fancy clamps. We use Cue Goo, which is available in the tip & glue section of our online store. Even though a lot of people use Super glue or Araldite to adhere cue tips, we tend to steer clear of any glue that dries rigid. This is because it is not designed to take the constant impact & therefore the tip can fall off after as little as a month when the glue dries brittle. We use Cue Goo, which is available in the tip & glue section of our online store, click here to visit. Cue Goo is similar to Loctite 480 which is a flexible impact glue, regularly used to adhere rubbers on the inside of car doors & take the impact of a slamming car door. Both types of glue have the same active ingredients. The only difference is that Loctite 480 is black & Cue Goo is clear, keeping the appearance of your cue clean. What tip is better, an Elkmaster or a Blue Diamond? Even though there are many other tips on the market to try, there’s no denying that Elkmaster & Blue Diamond tips are the most commonly used, professionally. Both are made in the U.S from specially treated leather & have their own distinct advantages & disadvantages. Therefore the decision simply becomes a personal preference. Blue Diamonds are of medium hardness so have the better control when playing power shots. They are infused with chalk so that they grip new chalk when applied. 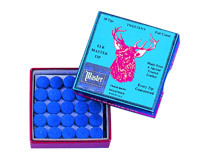 Blue Diamond tips last longer than Elkmasters because they are not only a little harder but also thicker. 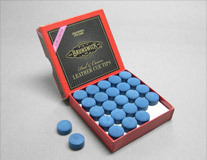 Elkmaster tips are also infused with chalk but are made from a softer grade of leather. Because of this softness, they generally, over a whole game, offer better control & spin on the ball than Blue Diamonds. The disadvantage is that because they are thinner, softer & become compacted more easily they need to be changed more regularly. Either a Blue Diamond or Elkmaster tip will be a vast improvement on a generic cue tip. The reason we use Blue Diamonds is to give you a fresh tip that gives you a cushioned feel to your new cue & won’t need to be replaced for quite a while. Where can I purchase Cue Goo plus Blue Diamond & Elk tips? Feel free to visit our contact page & you can order by phone, email or visit our online store by clicking here.